It’s Tuesday… one day closer to the Princess Half! I honestly have been thinking about this race for so long, it seems unreal that I’m actually going to run it. When I was running my first few 5Ks last year I would think about this race and how it was my goal to be able to run it someday. Of course I ended up running the Fort Lauderdale Half last year as my first, but the Princess Half is the race that got me excited about running. I’ll be honest and say I have no idea why since I’m not a Disney person at all, but they sure know how to hype people up! I didn’t write this in my 5K recap from over the weekend, but when I was passing the slower run/walkers I got really teary eyed. Last year at this time I was part of their group. It took me 42 minutes to run my first 5K (on a course that I think was short), and it took me 46 minutes to run my next two 5Ks on certified courses. I hate to say this, but I probably could have started bawling out there on the course, but I pulled myself together after some normal tears. Running makes me so emotional! Argh! I don’t like it. I’m not an emotional person! When I got home from work yesterday I had a surprise waiting for me — my new camera. 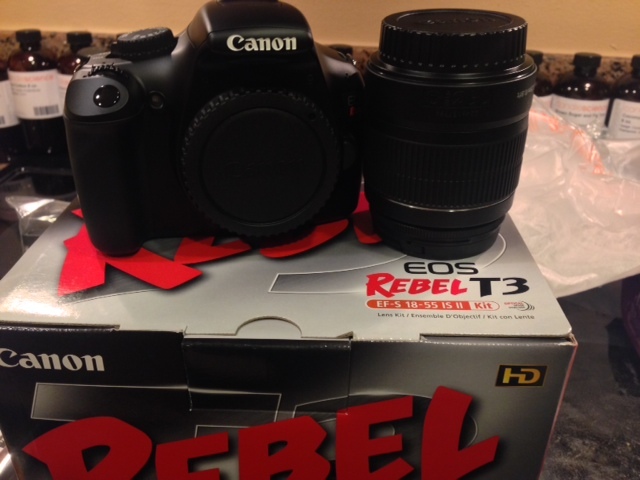 After reading about dozens of different camera types, I finally got a Canon Rebel T3. Amy @ Run Write Hike and her husband provided me with lots of great advice on camera types and lenses, so I know I need to invest in a good lens, but for now I’m excited to have a base. This camera is specifically so that I can take pictures of my soy candles. I’m tired of paying other people to do it and still not getting what I want (I am picky!). Now I can take my own pictures and if they don’t come out the way I want, I only have myself to blame … and can keep re-shooting until I what I want. There’s a guy that teaches a DSLR class at a park within walking distance of my condo every other weekend, AND he’s running a Groupon right now : ) Score! Do you have a DSLR camera? Top tips for a beginner? Do you have a dream race that you would do anything to run someday? – For me this has to be the Western States 100 course. I’ll never run a 100-miler but I’ve read about all the ultra champions who have won this race and can’t help but dream about it! My favorite part of Ragnar was catching a teammate as she crossed her exchange and watching her dissolve into tears and pride and joy. I teared up 1) at my last Ragnar exchange 2) at the half my parents watched 3) at my most recent half when I PR’d. Just to name a few. I think the endorphins and adrenaline really add to the emotions, but it’s one reason I love running. We get so emotionally involved! I know this race means a ton to you, and that means you’re going to LOVE it and run a really great one! Yes! Adrenaline + endorphins = the perfect recipe for happy tears! I get emotional at races as well. My first race was at the starting line when they sand the national anthem, had to pull it together. This weekend it was as my fiance was finishing her 10K, I was sooooo proud of her. Dream race? Not sure, need to start looking into them more. Aww that’s awesome that you’re so proud of her! I love that! I wouldn’t count yourself out of a 100 miler! I know you want to run ultras, and I think you would do really well at them! Do you ever run trail? Most ultras are on trail. I looooove trail. Ugh, I want to run trails so much, but the closest trail to my house is only 2 miles long 🙁 My running coach says she knows of a nice trail we can do, but that she doesn’t want me to do it until after my half since it’s really technical and she doesn’t want me to break an ankle! Hi Annie! Thanks for dropping by. Western States is such a dream, but so hard to get into. There is a new 50-miler starting this year on the Western States course called the Outlook 50 Miler. I may try to run that sometime “soon” (as in the next couple of years). I think that there is a lot of emotion associated with running and racing. I’m going to surprise my sister-in-law this weekend at her first marathon and I feel sure I will cry watching her finish that race (I helped her get into running years ago and if we lived closer we would train together but…). Your new camera looks awesome. I would love to get a DSLR but I’m afraid that I would never take the time to really learn how to use it. Hi Kim! That’s so awesome that you’re going to cheer your sister on this weekend. Congrats to her on running her first 26.2! As much as running makes me cry while I’m out there on my own, reading/hearing about other people’s running stories makes me cry doubly hard. I’m a total sucker for a good, inspirational running story! OMG I WANT YOUR CAMERA… ok that was really me yelling at the computer. Anyhow YEAHHH for your upcoming half!! If there is a meet up I totally want to come over and say hi to everyone!! I don’t know about any official meetups yet, but I will definitely keep an eye/ear out for one. Would love to meet up with everyone this weekend! Running makes me cry too. When I cried when I finished my first half and I’m going to sob when I finish PHM. This is 2 years in the making and the whole reason I became a runner. I can’t believe it’s finally here! I totally thought I would have cried at my first half, but I was so thirsty at the finish line I couldn’t produce any tears haha. I can definitely see myself sobbing across the finish line at the PHM this weekend though! Yay-So glad you got the camera! I cannot wait to hear how the process of starting to use it goes. It is a big, fun learning curve for sure! I bet this week is feeling long!!!! I know you just want the weekend to be here lol It sounds so fun, I can’t wait to hear all the details about it! The camera looks really awesome 🙂 You’ll have to share your handiwork!